Boyds Mills Press, 9781590789568, 40pp. Niko and his crew embark on an intergalactic adventure to the Planet Zorg, where Niko's cousin Sasha is being held captive by a space pirate (who is actually Niko's sister, Posh!). But when Niko and his crew charge in to the rescue, the girls do the unthinkable by capturing his ship and leaving him stranded far from Planet Home. Using his characteristic ingenuity and wit, Niko manages to take back control of his spaceship and his story. 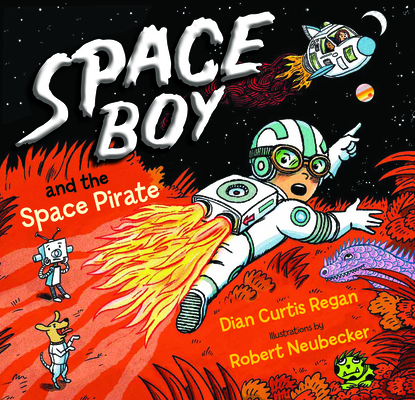 With a picture book format, comic book–style artwork, and humorous, simple text, Space Boy and the Space Pirate is both a thrilling adventure and a celebration of the power of pretend play. Dian Curtis Regan is the author of many books for young readers, ranging from picture books to young adult novels. Her books have received many honors, including Best Books for Young Adults, Children's Choice Awards, and appear in Los Angeles Times Recommended Books and New York Public Library's Best Titles. She lives in Colorado Springs, Colorado. Visit diancurtisregan.com.